Siyani Chambers and Laurent Rivard of the Harvard Crimson celebrate as the Crimson defeat the New Mexico Lobos 68-62 during the the 2013 NCAA Men's Basketball Tournament on Thursday in Salt Lake City, Utah. "Last year, the Crimson made the tournament for the first time since 1946, losing to Vanderbilt. "Laurent Rivard, a junior guard from Quebec, said it was something he dreamed about as a little kid. 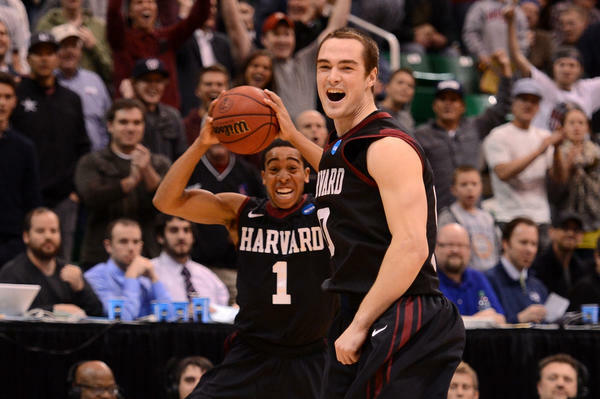 "'To do it with Harvard on our chest, it can't get better than this,' Rivard said." -- ESPN reports: "Since seeding began in 1979, the 46-point victory by 5-seed Virginia Commonwealth over No. 12 Akron was the largest margin of victory ever by any team seeded lower than 2. That record lasted for about an hour. Syracuse, a 4-seed, broke it with a 47-point win over Montana." -- Butler, a Cinderella team in 2010 and 2011, advanced with a 68-56 win against Bucknell. The big deal here is that five of Butler's top seven players are NCAA tournament newbies. But as ESPN points out, the Butler character hasn't changed. "is 12-4 (.750) in NCAA tourney games. The only coaches that began this tournament with higher percentages are Mike Krzyzewski (.767) and Roy Williams (.753)." -- The most devastating defeat goes to No. 14 Davidson, which fell 59-58 to No. 3 Marquette. It was a cruel loss because Davidson was seconds from a tremendous upset. "When it was over Thursday night, after 39 bracket-busting minutes and one of pure mayhem, the Davidson Wildcats sat on their chairs, as if unwilling — or, perhaps, unable — to move. It was still all too fresh for them, how defeat was snatched from the jaws of victory, another monumental upset in the N.C.A.A. tournament filched with a second to spare. "'It was just like, 'How did that happen?' Davidson guard Tyler Kalinoski said." -- Two-Way readers, who are incredibly smart, correctly predicted that the most likely upset would happen between Oregon and Oklahoma State. Oregon, seeded 12, beat Oklahoma State, seeded 5th, by a score of 68-55.